After Canaletto, we dedicate another blog post to one of your favourite Italian artist; the great Titian. Titian (also known as Tiziano Vecellio) was the greatest artist of 16th century Venice. At the time, Venice was a republic and one of the most powerful and cosmopolitan centres in the world. The city was admired for its creative, artisan trades and experienced an artistic boom at the end of the 15th century that prospered throughout the 16th century. Venetian Renaissance artists were admired for their remarkable use of colour. This was partially due to their access to a wide range of pigments made available through the trading privileges of the Venetian Republic. However, the warm colour palette that characterised Venetian art of this period has been attributed to the beautiful, soft light that can be found in the city of Venice. The light of Venice is a result of the water that fills and surrounds the city. It makes buildings shimmer and creates a powdery light; it is handling of light and colour, known as colore, that gained Titian international fame. Titian studied under Giovanni Bellini, who was one of the most influential and important artists in Venice, and worked alongside the artist, Giorgione, in many artworks. While the influence of such artists undoubtedly contributed to his early style; Titian would become an artist that was fundamental to the development of Venetian – and European – painting in the 16th century. 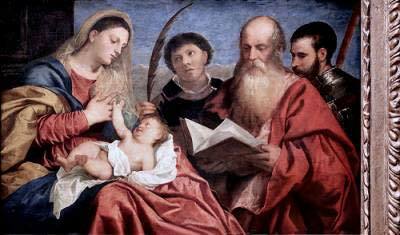 Titian was first to become famous for his religious works. His Assumption of the Virgin (Assunta) for the Santa Maria Gloriosa dei Frari, broke with recent traditions and demonstrated his amazing ability to combine dramatic force with dynamic tension. Do you like Titian’s work and would like to follow in his foot steps in Venice? Then click here to check our painting holidays in Italy for 2015 or contact one of our friendly team members.